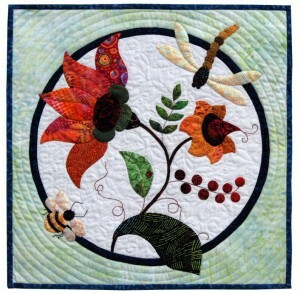 That Raleigh quilt shop is Wish Upon A Quilt, and–as a result of a call for quilts issued on their blog–the shop quickly collected and dispatched approximately 50 quilts to the NY Metro area heavily ravaged by Superstorm Sandy (and its aftermath). The driving force behind this amazing relief effort is New York City quilter, Victoria Findlay Wolfe (Bumblebeans BASICS). Victoria reports that the response has been overwhelming–so overwhelming, in fact, that the offices of the distributing agency have been swamped with beautiful quilts, and no more quilts can or will be accepted after December 7. She thanks quilters around the country for their incredible generosity, and encourages them to seek alternative programs still in need of assistance with recovery. 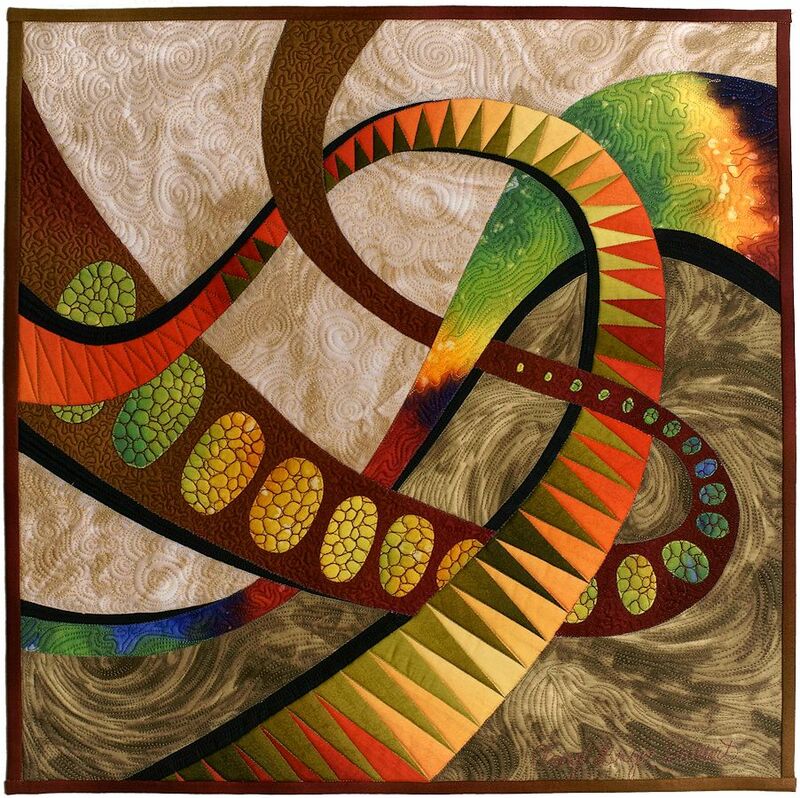 During the four-and-a-half days at the 2012 International Quilt Festival in Houston, the Alzheimer’s Art Quilt Initiative, founded by Michigan quilter Ami Simms, sold 1,597 quilts, earning $75,000 for the AAQI. Read more about AAQI’s outstanding success in Houston here. The Alzheimer’s Art Quilt Initiative is a national, grassroots charity whose mission is to raise awareness and fund research for this devastating disease. Since 2006, the 501(c)(3) nonprofit organization has raised more than $870,000 for Alzheimer’s research through donations, the sale and auction of donated quilts, and various other fundraising activities. As a result, grants have been awarded to researchers at Cornell, the University of Michigan, University of California/San Diego, Temple University, and other similar institutions. 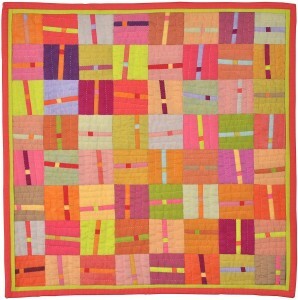 Visit the AAQI website to learn 33 Ways You Can Help–including purchasing or donating a quilt! 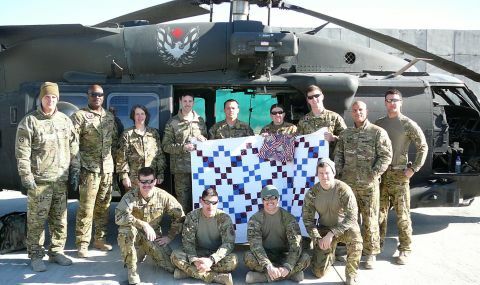 Blue Star mom Catherine Roberts began the Quilts of Valor Foundation in 2003 from her sewing room in Seaford, DE. Motivated by her son’s year-long deployment to Iraq, and her desire to see that returning vets were welcomed home with the love and gratitude they deserved, she hit upon the idea of providing each one with a tangible expression of appreciation and gratitude. Since then, QOVF has become a national, grassroots community-service effort, connecting the homefront with those who serve on the battlefront. According to Executive Director June Moore, the official number of quilts presented to date exceeds 70,000. Whenever possible, presentations are made in person. These occasions are understandably moving, and the QOV site features video-taped interviews that underscore the meaning of the QOV quilts both to the veterans and to the quilters who made them. “There are never enough quilts to fill the requests for them,” June says. Click here to learn more about QOV, including how you can become involved by making quilt tops, machine quilting them, making a monetary donation, or requesting a quilt for a veteran you know. 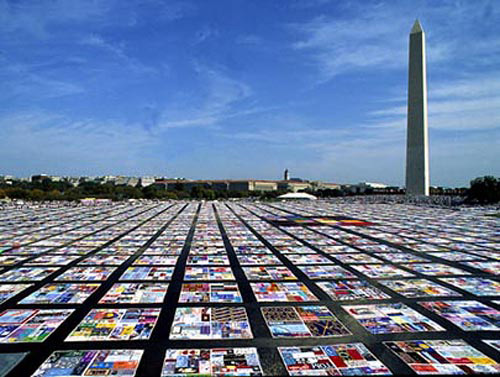 The AIDS Quilt Project on the Mall in Washington, DC; the AIDS quilt is made up of thousands of 3′ x 6′ panels, each made by family members and friends in memory of a loved one lost to AIDS. The AIDS Quilt Project is featured in Episode 7 of Why Quilts Matter: History, Art & Politics. I have just started quntiilg in December and have become a crazy lady over it on the weekends. My dining room is overtaken each weekend my husband is patient with me but on Sunday nights it all goes away. Doing all kinds of tutorials and learning so much and just bought a new sewing machine and of course the walking foot! Just did the rounds for folks in my family making quilts, but donating to charity is the next stop with baby quilts. I have previously donated many pillow cases and flannel receiving blankets to the locate women’s shelter in my hometown. Great to hear the story from you on what you have been doing amazing.